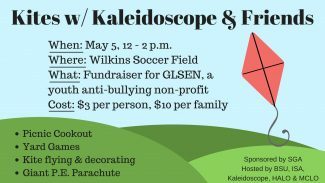 Grab a couple pals and come on down — Kaleidoscope and friends are hosting an anti-stress kite flying event on campus from noon to 2 p.m. Saturday, May 5, on the Wilkins Soccer Field. Kaleidoscope is partnering with the Black Student Union (BSU), the International Student Association (ISA), the Hispanic-American Leadership Organization (HALO), the Multi-Cultural Leadership Organization (MCLO) to make this event, which is sponsored by the Student Government Association (SGA), possible. Hiegert said the event will be similar to the Holly Jolly Holiday Party, which took place in November as a way to raise money for the South Central Mental Health (SCMH) center, a nonprofit organization in Kansas. For a $3 per person entrance fee, or $10 per family, guests will receive a meal ticket and kite to decorate and fly. All proceeds will go to the Greater Wichita GLSEN Chapter. Hamburgers and hot dogs will be served along with different sides, drinks and an elote bar with “all the traditional Mexican fixings,” made by members of HALO. Hiegert said Kaleidoscope brainstorms many ideas for its events by first coming up with a fun name, then building an event around it. 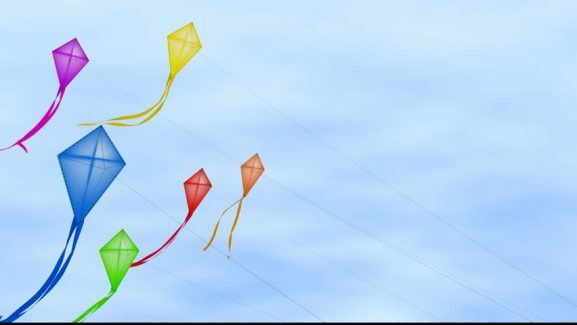 “Kevin thought that ‘Kites with Kaleidoscope’ sounded really cute and I think everyone else did, so we pitched it at a meeting and the event formed from there,” Hiegert said. Junior Kevin Clack, president of Kaleidoscope, said that he always loved kites while growing up. “Overall, no matter who comes out to the event, they’re sure to have a good time whether they’re hungry, love kites or just want to enjoy good weather,” Clack said.